They can be on recipe cards, in handwriting or typed out, decorated or left plain and simple. Include notes on why you love it or just go for the straight recipe. It's really up to yall however you'd like to make it special for your recipient. 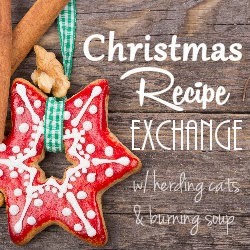 You can include a Christmas card as well or just send the recipe. For me, it's too early for Christmas. In reality, we do need to start realizing it's going to be here before we know it! This sounded like a fun way to expand on my holiday recipe list (which is kinda small). Now I just have to figure out what I'm going to share! If you're interested in signing up head over to the Sign-up Post at hearding cats & burning soup. If I don't start thinking about organization now, I'll find myself way behind very fast. I haven't seen Christmas yet outside of stores but I know it's only a short while away. A lot of Halloween and fall but that's all okay! It is waaaaaay too early, isn't it?? But it's good be thinking ahead too. Fun idea. Yes it is, but I need to time to find what I'm going to share.